The thermal transfer version of the 2824 Plus series also offers a performance range and functions that are usually only provided by large printers. 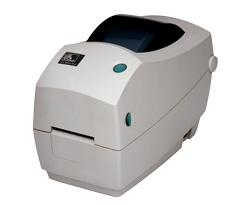 These elegant compact printers from Zebra bring fast, professional labelling to your desk, small office, laboratory or anywhere printing small numbers of bar-code labels, receipts and tags is needed. Thanks to the Open ACCESS Design and diverse setup programmes, the printer is simple to set up, consumables are easily replaced, and configurations are carried out in no time at all. Through its easy handling and the favourable price, the TLP 2824 is the perfect printer for diverse areas of application. Using combined direct-thermal/thermal-transfer process, the TLP2824 Plus produces the smallest receipts 25-60 mm wide at up to 102 mm/sec. The resolution of 8 dots/mm 203 dpi and the expanded memory 4MB Flash, 8MB SDRAM - optionally up to 68MB guarantees quality prints in milliseconds even with elaborate applications. The series comes standard with the EPL and ZPL programming language as well as all OPOS drivers, and is easily integrated into almost all existing systems.